The food truck craze has been taking the world by storm lately. It can be a great way to be your own boss and set your own hours, but knowing how to start a food truck business is often the biggest roadblock for many. To try and help ease that burden and encourage you to follow your dreams, we put together a list of 6 basic tips to get your idea off the ground and on the road to reality. Just because you are a mobile business doesn’t mean that you are exempt from all of the typical expectations. Get licensed. Create a business plan. Get a truck permit. Plan where you will park your food truck. Get a food handler’s permit. Get insurance. Every city will differ slightly on their requirements, so make sure you look up ALL requirements that your city may have to make sure you don’t accidentally forget to check something off of the list. You can’t just set up a food truck wherever you want, whenever you want. Many cities have a maximum number of food truck permits they will issue at any given time, so make sure you are able to obtain a permit before purchasing a truck and investing your entire life into your endeavor. One food truck owner in New Orleans ran into this predicament and worked with her City Council to increase the permit number from a mere dozen to 100! If there are no more permits available in your city, don’t lose hope – consider working with your City Council to change the restrictions. What type of food truck do you want to be? What type of food do you want to make and sell? It’s great if you love tacos, but how will tacos differentiate you from the dozens of other food trucks around you that sell tacos? Do you want to do some type of fusion experiment between two different food types? Try writing down all the different food ideas you have, whether they’re connected or not. Once you’ve got a full list, see if there are any unique combinations you can make with the items you singled out. Unless you are lucky enough to have a rich uncle leave you his estate, you will likely need to secure financing to start your mobile food truck business. First, determine exactly how much you will need. On top of other expected expenses, a food truck can be anywhere from $20k-40k to $100k-200k, so make sure you’ve done a detailed analysis of your expected costs. Consider getting a small business loan through the SBA. The SBA does not fund your loan, but they do guarantee at least a portion of your loan. This mitigates the risk so banks and alternative lenders feel more secure in financing your business. Though an SBA loan is one of the most popular options, there are plenty of other small business loans available to you that you can pursue here. Now comes the fun part – getting a food truck! Make sure it has all the equipment you will need to cook your food(s) of choice, or that it has the capability to be custom fit to fill your needs. Keep in mind, if you plan to prepare food on site, you will need a much bigger truck than if you intend to cook elsewhere and bring the food in warmers. It’s a blessing and a curse to be a mobile business. The great thing is that you can take your food truck wherever you want, to whatever function you have permission to be present at. However, this can also make it more difficult to develop a regular customer base. 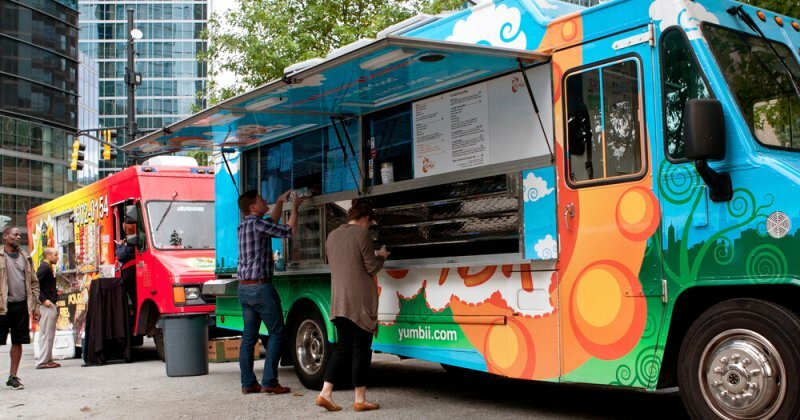 Because of this, marketing your food truck is absolutely essential to your success. Start a Facebook page, Instagram, Twitter, and whatever else you feel will be beneficial to your budding food truck. Post where you will be and when. Consider posting certain specials for your loyal followers, or a discount for referrals. Ultimately, do whatever you can to make sure people know about you and how to find you. Running and operating a food truck can be very rewarding and exciting. It may be an uphill battle in the beginning, but don’t let the bureaucracy of your city keep you away. Take these basics of how to start a food truck business, and set a plan in motion to get your business off the ground and onto the streets of your city. We’re rooting for you!